I took this photo in the main square in Cortona, Tuscany in April. 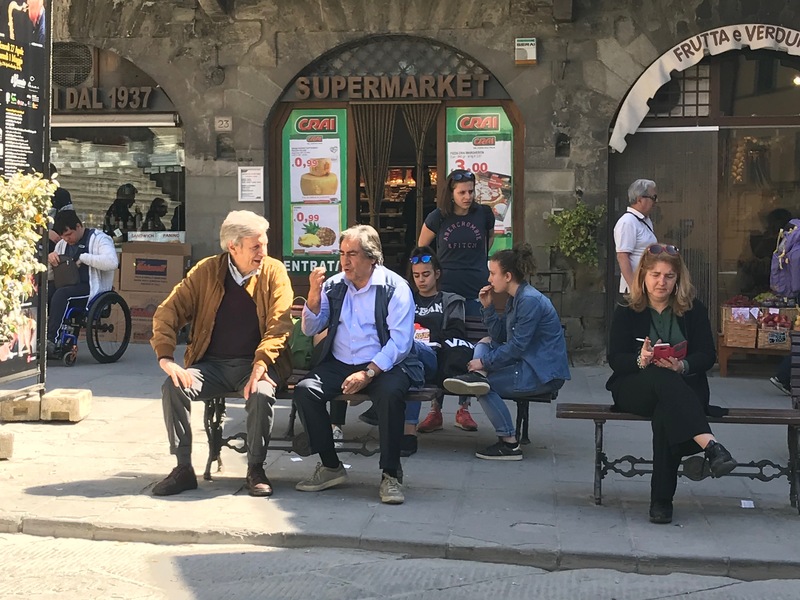 We were visiting the city and enjoying the food and the shops and just wandering around – these two men deeply engrossed in conversation caught my attention. I’ve known from the outset this would become the basis of a wall art project. I started playing with the image yesterday – first I wanted to remove the other people, to isolate the companions. The blue-shirted gentleman is making a classical Italian gesture – thumb pressed to first and second fingers moving his wrist back and forth; in his other hand he has a cigarette. I want to bring the viewer’s eye to this man. 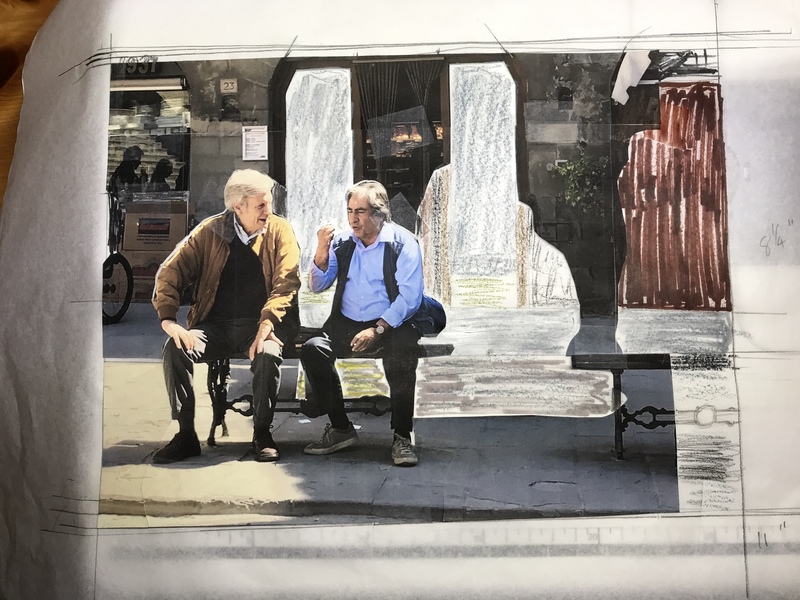 With the other people removed and just the shops behind, the men now stand out – I removed the advertising from the supermarket windows – I will do them in the same dark colours you can see through the open shop door. I intend to keep the partial bench on the right (having taken away the woman who is reading and smoking). Looking at this image now, I think I want the men to be on the right side – it’s got something to do with the speaker being stronger in that position. I’m about to try cutting off the building on the right and repositioning it on the left, reversing the bench so it is cut off at the left edge – that will also allow me to strengthen the greenery growing on the stones of the facade behind. It’s not enough that I’m taking on this project, I’m also working on a second. I took photos of some poppies in Marlene’s front garden this summer and these two oriental poppies are striking. 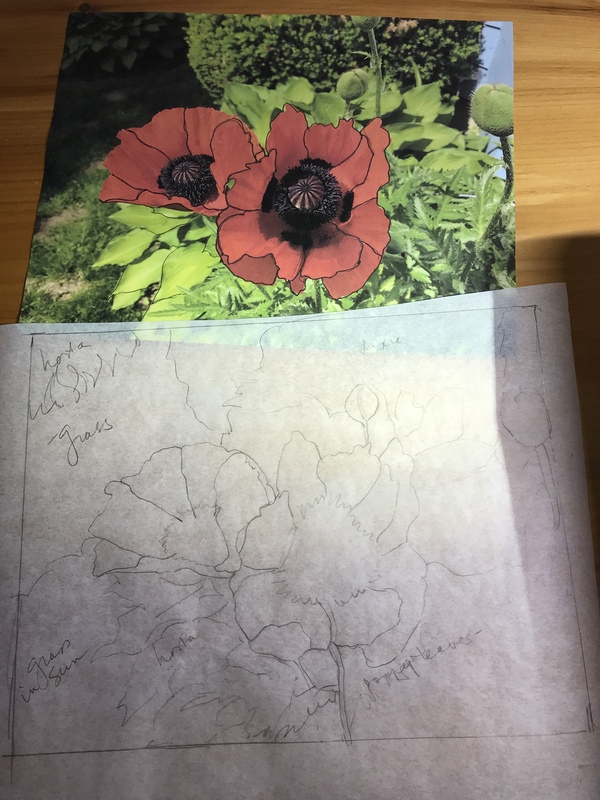 I started by outlining the petals so I could do a tracing which I’ll use for cutting out red fabrics. They’re growing beside a light green hosta, with a taxus shrub behind and a darker hosta in the top left corner. Tomorrow I will start looking for fabrics I can use to construct both these images. Generally I work on one piece at a time. For some reason both have been insistent I begin work on each of them.